In 2009, T-Gerding Construction was looking for a new headquarters location, and found one in Corvallis. T. Gerding Construction, a craft labor company, completes concrete and carpentry projects ranging from simple slab-on-grade single-story structures to multi-level cast-in-place concrete buildings. They had scouted locations, and Benton County wasn’t on their preliminary list. 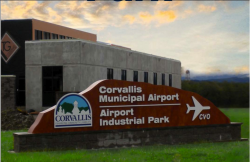 After being contacted by the Economic Development Office, they evaluated the Corvallis Airport Industrial Park and were apprised of its status as a “shovel ready” site. Support was given by the city and county for Enterprise Zone application assistance, and planning facilitation.